A safe and reliable home or business network is critical to your productivity, security and recreational use of your PC(s). On the other hand an open or unsecured wireless network can be a security nightmare resulting in account hijacking, data and identity theft in the worst case scenarios. We offer setup, upgrades and repairs to wired and wireless networks for both home and businesses located in the Tucson metro area. We can increase your business productivity with network shares, Active Directory services and Virtual Private Networks allowing you to connect to your business network anywhere in the world. In your home we can provide you with media & printer sharing, personal cloud services and a safe secure wifi access point for your family. 7e Digital LLC is located in Tucson, AZ and is ready to service all of your home or business networking tech. Schedule an on-site appointment online or give us a call at (520) 393-9299. Whether in a home or business we can setup the perfect wired or wireless network to suit your needs. Our network will be constructed with the most reliable and secure tech available to keep your mind at rest. In addition to setting up your new network there are several additional services we can add like shared data storage, printer & media sharing(audio, video & images), VPN's and personal cloud services. Are you not able to access the internet or a computer share you once were? We can diagnose the problem and fix it, usually within an hour of arriving on-site. Most people have movies, videos, music & pictures that they would like to share with all the devices in their home, but they are only on your PC. We can setup media streaming services(aka DLNA) services on your network so most modern network enabled devices can access this content, even your on your XBox, PS3 and TV. My wireless router doesn't have a password, but that's no big deal, right? WRONG! You may think your doing your neighbors a favor by sharing your internet, but you are leaving yourself vulnerable to attack. Your neighbor, their guests and even someone parked on the street with a car can packet sniff on your network. Packet sniffing allows the intruder to steal your private information and passwords for your Facebook, bank accounts and any other information you pass through your network. Have you ever wanted to access the files on your computer or network storage from anywhere in the world? If so we can set up with a personal cloud that you can access from any computer, smartphone or tablet in the world. Keeping your family photos or business files on just one computer can result in the loss of important files when a hard drive or device fails. We can set you up with a NAS(Network Attached Storage) server, off site backup and other means of keeping your valuable data safe from theft, water damage and fire. 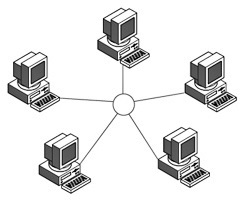 Active Directory provides all of the computers connected to your network with a universal contact list, scheduling calendar, centralized management and the same username and password for user(s) throughout the network. These benefits can be securely shared locally, nationally and nationwide. Maximize your work flow by sharing all of your printers throughout your entire business or home network. Are you looking to upgrade you businesses network and computer systems and don't know where to start? Let us maximize you workforce with the latest technology by scheduling an appointment for our technology consultation services today.